UC Santa Cruz may not have a medical school, but its scientists are tackling some of the most challenging problems in cancer genomics, drug discovery and basic cancer biology. Scott Lokey is not easily discouraged. In fact, he seems to thrive on scientific challenges, like taking on what the pharmaceutical industry calls “undruggable targets.” The term applies to molecules known to play a key role in disease but not susceptible to control by the kinds of small molecules that make good drugs. Lokey, a professor of chemistry and biochemistry and director of the Chemical Screening Center at UC Santa Cruz, is working with compounds that he thinks could overcome the obstacles presented by “undruggable” targets. If successful, his work could lead to a whole new class of drugs to fight cancer and other diseases. One such target is the retinoblastoma tumor suppressor protein, which normally puts the brakes on cell division. Its function is disrupted in most human cancers, allowing cancer cells to proliferate. Scott Lokey, professor of chemistry and biochemistry at UC Santa Cruz and director of the UC Santa Cruz Chemical Screening Center, discusses how UC Santa Cruz researchers are taking on "undruggable" targets. Taking on challenging drug targets is just one way to make progress against cancer. Researchers at UC Santa Cruz are attacking the disease from every angle. While the Chemical Screening Center searches for new cancer-fighting compounds, biologists are identifying new targets for the next generation of cancer drugs, and genomics experts are harnessing the power of big data to usher in a new era of precision therapies. The campus may not have a medical school, but that doesn’t keep its scientists and engineers from working at the cutting edge of biomedical research. All advances in cancer treatment­ — from the development of new therapies and diagnostic tools to the use of genomics to guide treatment decisions — are rooted in understanding the fundamental biology of cancer cells. Cancer is a disease of the genome, caused by genetic changes that lead to uncontrolled growth and proliferation of tumor cells. Genomic analysis of tumor cells can reveal the genetic errors driving a patient’s cancer, but the enormous diversity of genetic abnormalities found in cancer cells makes interpreting the genomic data a huge challenge. Researchers at the UC Santa Cruz Genomics Institute are developing sophisticated computational methods for analyzing genomic data to help doctors choose the most effective drugs for individual patients. Known as “cancer genomics,” it’s a powerful approach that builds on decades of ongoing work by biologists to understand exactly how genetic changes drive cancer. The genetic abnormalities in cancer cells disrupt the signaling networks or “pathways” that regulate cellular activities. The life of a cell is orchestrated by a vast interconnected web of these pathways. Each pathway involves a complex series of interactions between cellular proteins, complete with feedback loops, cascading amplifications, and intersections with other pathways. Some of the proteins in these pathways have crucial interactions with the cell’s genetic material: the chromosomal DNA where genes are encoded and the RNA molecules involved in gene expression. Biologists like Lindsay Hinck, Doug Kellogg, Jeremy Sanford, and others in UC Santa Cruz’s Department of Molecular, Cell and Developmental Biology (MCD Biology) have made remarkable progress in unraveling the details of signaling pathways and their roles in cancer. Hinck’s lab, for example, has been studying the “Slit/Robo” pathway, which controls breast development and is disrupted in breast cancer and other cancers. Lindsay Hinck, professor of molecular, cell and developmental biology at UC Santa Cruz and co-director of the Institute for the Biology of Stem Cells discusses how understanding the fundamentals of cancer biology is the key to developing new cancer therapies. Slit/Robo signaling is actually involved in several critical pathways controlling cell proliferation and migration. The tumor suppressing effects of these pathways make them potential targets for drug development efforts. Hinck’s investigations of these pathways continue to reveal new insights, most recently on their roles in hormonal regulation of breast cancer cells. “Understanding how subpopulations of breast cancer cells respond to hormones such as estrogen and develop resistance to anti-estrogen treatments is likely to be very important for the next level of drug targets,” Hinck says. Working out the cellular signaling pathways involved in cancer can lead to clinical applications in a variety of ways. The most obvious is identifying a key molecule as a promising target for drug development, which often leads to more focused research on that particular molecule. Much of Seth Rubin’s research, for example, is focused on the retinoblastoma tumor suppressor protein (called Rb). Rb is a central player in many signaling pathways that are disrupted in cancer cells. It is called a tumor suppressor because it blocks the proliferation of abnormal cancer cells. “Rb is a stop sign that keeps cells from proliferating, so cancer cells have to turn it into a go sign,” explains Rubin, a professor of chemistry and biochemistry who has worked out the detailed structure of Rb and how it interacts with other proteins. Rubin has been working with Lokey’s lab and the Chemical Screening Center, developing a strategy to directly activate the Rb protein with a drug and turn it back into a stop sign. There are two issues that make this especially challenging. One is the goal of activating a protein that isn’t functioning properly. Most drugs are inhibitors that interfere with the function of their target; many cancer therapies target overactive pathways and aim to shut them down using inhibitors. “It’s a lot easier to knock down the function of something with a drug, because you’re basically just throwing a wrench into the system, whereas fixing something that’s not working is a lot harder to do,” Rubin explains. The other challenge is structural. Most drugs are small molecules that easily penetrate cells and block the target molecule by binding to its active site, typically just a deep pocket in its structure. “The standard analogy is that it fits like a lock and key, but it’s more like a baseball in a glove. That describes the vast majority of drugs and their targets,” Lokey says. But the active sites of many undruggable targets like Rb are large and complex, so an effective drug would have to be correspondingly large and interact with the target in complex ways, not just fit into a pocket. Lokey’s lab is working on the synthesis of large molecules that can bind to more complex targets and can also penetrate cells. In work led by Cameron Pye, a graduate student in Lokey’s lab, the team developed an assay to screen large numbers of these compounds (called cyclic peptides) for their ability to activate Rb. The lab has begun preliminary screening through a collaboration with Roche NimbleGen. Understanding the pathways that drive cancer cells can yield not only drug targets but also clinically useful “biomarkers” to guide prognosis and therapeutic decision-making. In Zhu Wang’s research on prostate cancer, for example, he is studying the molecular mechanisms that make some prostate cancers highly aggressive. Many prostate cancers are slow-growing and may never threaten a patient’s health. Pathway analysis plays a critical role in cancer genomics and has been a major focus of research in Josh Stuart’s lab. Stuart, the Baskin Professor of biomolecular engineering, recently published a study of metastatic prostate cancer yielding a detailed map of the abnormal signaling pathways that enable prostate cancer cells to proliferate and evade treatment. In collaboration with a team at UCLA, Stuart’s lab developed a novel computational analysis to produce personalized diagrams of the signaling pathways driving a patient’s cancer cells. A persistent problem in cancer genomics has been distinguishing “driver” mutations from “passenger” mutations. 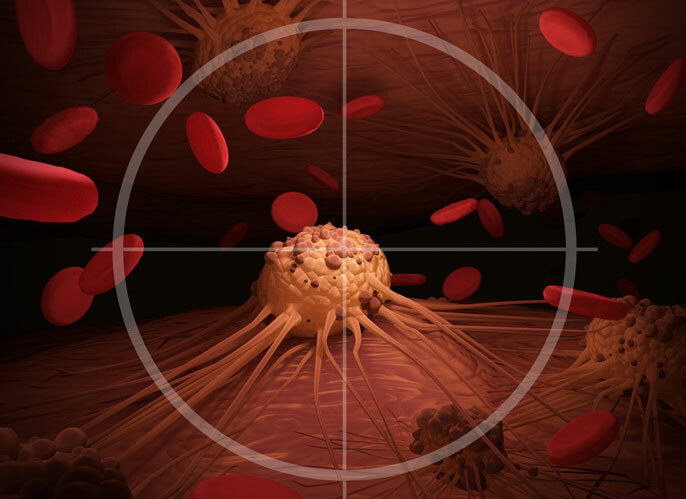 Cancer cells often accumulate large numbers of genetic mutations that do not play a role in driving the uncontrolled growth. These passenger mutations effectively create static that interferes with the signal for mutations that are the real drivers of cancer. Aggregating data from large numbers of patients can give researchers enough statistical power to identify driver mutations. “Genomic medicine requires massive data sharing and analysis,” says David Haussler, professor of biomolecular engineering and director of the Genomics Institute. For years, Haussler has been an evangelist for data sharing to advance genomic medicine. In 2012, his team created the first public cancer genome database for the National Cancer Institute, the Cancer Genomics Hub. A year later, he cofounded the Global Alliance for Genomics and Health, an international nonprofit that is helping establish the infrastructure for data sharing in genomic medicine. Research led by the Genomics Institute has demonstrated the value of massive datasets in cancer genomics. In 2014, a groundbreaking study led by Stuart’s lab, based on analyses of molecular data from thousands of patients with 12 different tumor types, revealed that classifying tumors based on molecular subtypes, rather than the traditional tissue-of-origin system (i.e., breast cancer, lung cancer, etc. ), could lead to different therapeutic options for as many as one in ten cancer patients. This type of “pan-cancer” analysis is only possible with data from large numbers of patients. Childhood cancers are rare, which makes it especially hard to assemble data from large numbers of patients. The Genomics Institute launched the Treehouse Childhood Cancer Initiative to address this problem and recently received a major grant from St. Baldrick’s Foundation to support the effort. A clinical pilot project launched in 2015 showed that real-time data sharing can identify new and better treatment options for children with cancer. Treehouse Childhood Cancer Initiative aims to make a huge difference in the world of pediatric cancer. Experts have long understood that there is no silver bullet for cancer and that it is not, in fact, one disease but hundreds of diseases with different causes requiring different approaches to treatment. At the same time, there are good reasons to be optimistic about the prospects for more effective cancer treatments. Cancer immunotherapy, which uses drugs to coax the patient’s own immune system to eliminate the cancer, has shown particular promise in recent clinical trials. Haussler is collaborating with protein chemist Nik Sgourakis to advance immunotherapy using genomics. They are developing new computational tools for analyzing tumor genomes to predict which mutated proteins are displayed on the surface of tumor cells where they can be “seen” by the body’s immune system. These predictions are then evaluated on patient samples from medical collaborators at NIH, UCLA, and Children’s Hospital of Philadelphia. With this information, it may be possible to more specifically train the immune system to find and eliminate tumor cells, Haussler said. Whether in cancer genomics, drug discovery, or basic cancer biology, cancer researchers at UC Santa Cruz tend to tackle the most challenging problems and pursue ambitious projects. “We have a unique perspective based on who we are and the expertise we have here at UC Santa Cruz,” says Kellogg, professor of MCD biology. For example, UC Santa Cruz is known as a leading center for research on the biology of RNA, and that has attracted talented young faculty such as Angela Brooks in biomolecular engineering and Jeremy Sanford in MCD biology, who are investigating the role of RNA in gene regulatory networks and cancer. “We’ve always had strength in RNA biology, and now there’s a good core of people here who are thinking more about RNA and disease. It’s an area that has not been well studied in cancer biology,” Sanford says. “You could say we tackle the hard problems and take on things that no one else is doing,” says Hinck. Most of the cancer researchers at UC Santa Cruz are funded by major grants from the National Institutes of Health (NIH), including the National Cancer Institute. As the single largest funding source for UC Santa Cruz research, NIH awarded nearly $40 million in grants to support campus research projects in 2015–16. Private foundations like St. Baldrick’s are also important sources of funding for cancer research. The Santa Cruz Cancer Benefit Group (SCCBG), a local charity supporting cancer research and patient care, has awarded small grants to a number of UC Santa Cruz faculty, including Rubin, Lokey, Hinck and Wang. These grants fund pilot studies, the results of which can lead to much larger grants from NIH and other major funders. “That kind of seed funding is really important,” Rubin says. SCCBG funding has enabled Lokey to start a new project searching for compounds that could improve the effectiveness of cancer immunotherapy drugs. Immunotherapy drugs known as checkpoint inhibitors have taken the oncology world by storm, he says, but they work for only a subset of patients. Lokey hopes to find compounds that can make tumors more visible to the patient’s immune system. UC Santa Cruz: A gold bullet for cancer?